Please contact owner Scott- Via Email: scesser@yahoo.com - or Phone: 724-612-2044. Pursuit 2670 - Boat has 2 Yamaha 225s, Stainless Steel Props, and Hydraulic Steering. 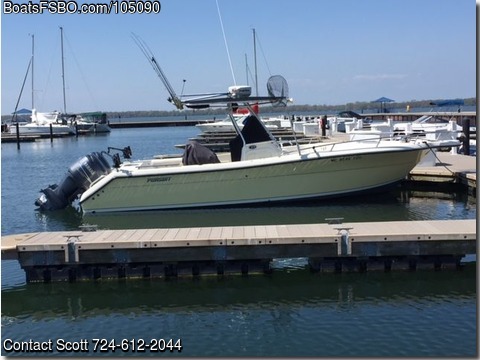 Center Console with Cuddy - can Sleep 2, Includes Head, Lots of Storage - used for trolling on Lake Erie - Boat has Raymarine Electronics, including Fish Finder, Radar, Auto Pilot, VHF Radio, and AM/FM/CD Stereo. Boat has Fresh Water Washdown, live well, T-Top, Rocket Launchers, Downriggers, Outriggers, Rod Holders, Fish Box, Cutting Board, and Planer Head Reels. Also includes 3 Batteries with 3-Bank Charger, Console Cover, and Matching Trailer. Everything you need for fishing and cruising. This boat has been Always Professionally Maintained, Always Fresh Water, and Stored Indoors.